Pixar is betting that a robot love story will be a summer blockbuster. Described as "rusty, lipless, sub-literate and keeps company with garbage" by The New York Times' Katrina Onstad, Wall-E stands for Waste Allocation Load Lifter Earth-Class. So basically Wall-E is a janitor/garbage man, er, robot. The film cost $180 million to make so if you add $50 for advertising, it has to clear $230 million domestically to make a profit. Wow. Glad we are not in the movie making business. Remember what happened to "Speed Racer?" In case you don't, it cost about the same amount to make and bombed big time. "This high-tech, piano-key-smooth egg-bot has dropped from the sky, seeking a sign of life on Earth. 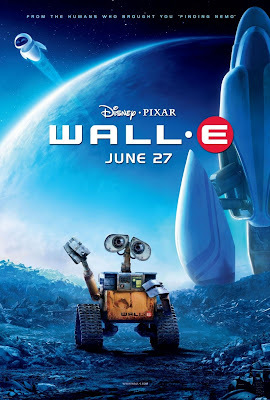 Wall-E, who knows about love from a video of "Hello, Dolly" falls hard." Oh oh. You have to figure that an outfit calling itself the African American Environmental Association will find a way to play the 'race card.' You better start running for the hills now cause here it comes. Clearly Wall-E is a black dude (less big lips) and Ms. smooth egg is a white chick. Did writer/director Andrew Stanton intend to produce an interracial robot romance movie? What about robot miscegenation laws on abandoned earth? Were there any such laws BEFORE the earth was abandoned? We doubt it. But you never know, particularly if robots act as crazy as humans. Well since they are the last two robots on Earth, maybe this interracial robot romance will work. Surely Klan robots are lurking somewhere to spoil their robotic bliss. We will see.